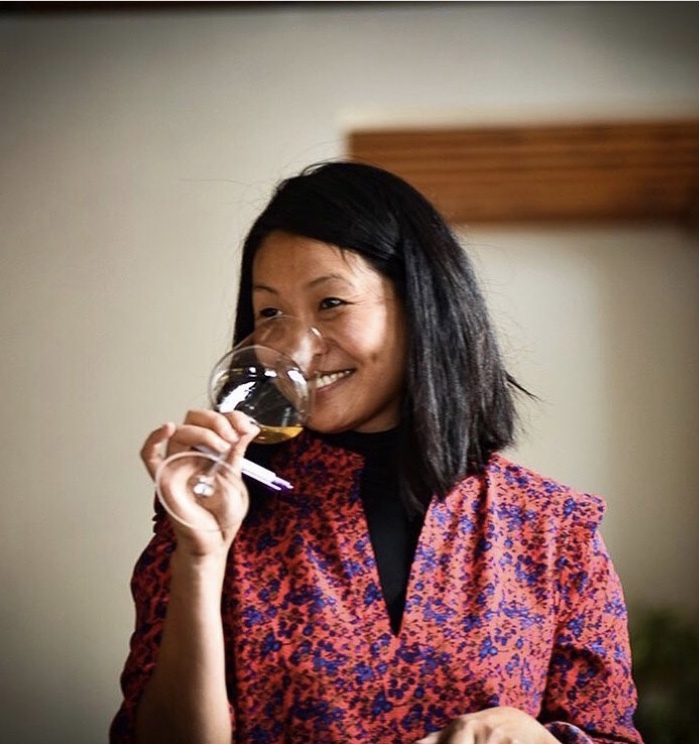 Heidi Nam Knudsen is the founder of the A Thousand Decisions, a wine course focusing on natural winemaking and growing methods. She is also the Operations and Wine Director for Farmacy, London and former buyer for the Ottolenghi group/former General Manager of Nopi restaurant. There are a lot of words buzzing around in the wine world: authenticity, natural, sustainability. Let’s talk about integrity at each level of the wine trade – from production to buying, from marketing to selling wines. When we are talking about integrity in the wines themselves what are we really talking about? Can we ever, for example, divorce the person who makes the wines from the wines themselves? HNK: This is something I struggle with. I meet winemakers who behave in ways I find extremely offensive and against everything I believe in. As a result, I find it difficult to buy and taste their wines without feeling the wines to be “tainted” in some way. But it’s a super difficult question as I am no-one to judge other people, but I honestly find it difficult to drink certain winemakers’ wines due to their conduct as human beings… My moral compass is always on high alert and I’m constantly asking myself if I should be supporting and promoting wines made by people who don’t behave kindly or with integrity. It’s an ongoing battle for me…. Can you make great wine without great terroir? Can you make great wine without farming properly? What constitutes good farming and good terroir? When we say “great” what does that mean? I certainly think you can make good wines even if your terroir isn’t great. This is where integrity comes in. You can make honest wines that may not be the greatest in the history of great wines, by being true to their terroir, even if the terroir is not great. In terms of making great wine without farming properly – no, I don’t think so. The two are intrinsically linked. What are the human qualities one needs to understand terroir and also to be a good farmer? I think you need to be sensitive, strong and humble! What is integrity in terms of winemaking? Should winemakers intervene? When is no intervention too little, and what is too much intervention? I believe integrity in wine requires transparency and for winemakers to be honest about their process. Whether you agree with them or not, if there is transparency, you can at least make an informed decision about supporting the wine or not. Secondly, it depends on what you mean by ‘intervene’. If you follow a formula or strict schedule without listening to your vines and wines, then you are intervening too much. I have seen this both in so-called conventional and in biodynamic winemaking. Sometimes, if you are dogmatic about the use of sulphur, you risk having unstable wines that don’t travel well and that are also temperamental… Intervention is a very personal issue for any winemaker and I guess everyone makes their decision based on how big a risk they feel they are willing to take with the final wine. It is natural to want to tell your story to sell your wine – do you feel that focusing on the public relations image can dilute the integrity of the winemaker and the wines? In the end the wine speaks for itself. I think as a wine buyer (or even as a regular consumer) you quickly realise if a wine is all image and no substance. Does branding compromise integrity in that consumers focus too much on the label or the reputation (justified or not) of the wine? Or does it lead to greater recognition? I know winemakers who make wines with brilliant labelling that is easily recognisable, wines that have become iconic – and deservedly so. In the end, as with so many other things, if you haven’t tasted the wine already, then you might subconsciously choose the wine because of its appearance (perhaps because it looks classic – or wild – or whatever might appeal to you). How has social media fuelled this sense of a global wine club where growers want to get their wines liked? HA! Good question. Not sure if it’s the growers who want to get their wines liked in this way. I feel that it’s more the consumers who have created the phenomenon. Wine is just like anything else on social media – don’t take any of it too seriously! Just follow your own instinct and seek out wines based on feeling rather than what social media tells you that you should drink! Do you think that many growers have jumped onto (what they perceive as) the natural wine bandwagon? Not sure if it is so much the growers as the importers…I have seen a change in how certain importers market their producers, employing many of the usual buzzwords to promote them. To what extent are natural vignerons making wines to appeal to a specific audience? I’m sure some do it more than others. Many natural vignerons make very small quantities, so there’s also a financial reason for this. I absolutely understand the need to appeal to a specific audience that you know will buy your wines. However, since we are talking about integrity, you need to be careful about who you intend your wines to appeal to. If you produce wines just to please certain people, rather than listening to your gut and making wines that respect terroir, then you might be compromising your integrity. Do you ever feel that the winemaking is getting careless, there are too many cuvees being produced, that vignerons are perhaps not challenging themselves to be more disciplined? Uhm….YES! Sometimes I find it hard to keep up with the many and ever- increasing number of cuvees being produced by certain winemakers. My problem is more to do with winemakers who sell different “lines” of wines. It doesn’t make any sense to me that winemakers should produce both natural and conventional wines. I believe making real wines is a way of life. You can’t have it both ways and ask me to believe in what you are doing. I understand that we all have to make compromises to support our dreams or visions, however, when it comes to natural winemaking, I actually think it’s a very simple choice. You either make natural wines because you would not do it any other way – or you don’t. There are an incredible number of artisan wine fairs now. Do you think this fact damages the integrity of the growers or that is it good for them to expose their wines to as wide an audience as possible? Wine fairs have helped certain winemakers gain more exposure and connected the general public with wines they wouldn’t otherwise encounter. In the grand scheme of things, the wines we are talking about here represent such a small percentage of the overall wine market, consequently, the more exposure the wines receive, the better. We forget that most people unfamiliar with these wines, so to get the general public involved and in front of them is a great thing! Also, it is nice to show the spirit of these wines in the context of how much fun you can have at a wine tasting (even if you spit!) because the energy at artisanal wine fairs is very different to how it may be at a classic wine tasting. In the end it is a balance. As a wine buyer I find it impossible to attend all the fairs, so can only imagine the challenge for winemakers who need to be present in their vineyards and cellars. Do you think that customers and importers fall in love with the image of the producer and the estate and therefore don’t sufficiently critically evaluate the wines? Absolutely. When I visit winemakers and having been warmly welcomed into their homes and dined with their families, I find it difficult to maintain my integrity as a buyer. I feel a certain pressure/expectation to buy the wines – sometimes, I so badly want to like the wines because the vigneron is a wonderful person, but if those wines don’t speak to me, I simply can’t buy them. I would feel like a fraud. Do you think that some of the prices charged by certain vignerons reveal a lack of integrity, or do they just need to make a living and the pricing is justified by the evident demand for the wines? Again, it’s about finding a balance, and your own moral compass. Nothing gives me more joy than seeing winemakers who have been struggling to sell their wines, suddenly being in demand, and thus able to pay off their loans and live a more “comfortable” life etc. But, as with so many other things in life, when do you have enough money? In general, the people I tend to work with certainly don’t have highflying lives, and, when their prices increase, I trust that it is because of the difficulties they are experiencing with low-volume vintages, and the higher winemaking expenses they have incurred. But ultimately, I also trust that everyone does what they believe is right, and if that entails raising prices because demand has grown, then good luck to you. It’s a shame if that means that the small restaurants who supported you since the beginning can no longer afford to buy your wines. One may perhaps question the integrity of that. Are wine buyers in danger of ignoring some really good growers/wines because they are fixated by having wine lists stuffed with the usual suspects? I can only speak for myself. I’m always on the lookout for wines that I don’t have to fight for in terms of allocations! If wine buyers ignore good wines and interesting growers just because they are fixated on a few ubiquitous “star” wines, then I think they need to look at themselves and ask who they are really buying for. When you drink a wine how do you “perceive” integrity in that wine? What properties does it possess that make it whole (and wholesome)? Integrity in wine (for me) is when you can taste the fruit that made the wine. Too much oak, sulphur etc masks the wine and makes me feel like the winemaker is trying to hide something. Integrity in wine is when you can taste the vintage in all its imperfections. Do you think we need to rediscover how to taste beneath the surface impression of the wine? Are we too influenced in a classical way by correctness (is the wine clean or faulty etc?) or conversely are being seduced by characteristics that are the result of neglectful winemaking? We need to ask ourselves why we like the wines we do. What’s a fault to me may not be a fault to you – and vice versa – and that’s the beauty! I think integrity is about being able to stand up for the wines you decide to champion, regardless of what challenges may arise from that. And to be confident in your taste and the way you feel about wine. The problem with tasting at wine fairs/wine tastings is that one tends to “judge” a wine very quickly. The wine is never given the opportunity to reveal its true self. To answer the second part of the question, I have noticed a belief in certain wine buyers/consumers for whom the “wilder and “funkier” a wine is, the more natural it must be. For me, this is just a lazy approach to wine tasting. You are going to be teaching a wine course called A Thousand Decisions. As well as the basics, is there a theme or central idea you would like to get across to prospective students? I would like people to get in touch with their emotions! Don’t believe the hype, feel what moves YOU – not what Instagram tells you to like. Develop the confidence to speak about the wines you love and defend what you believe in regardless of what other people tell you is right or wrong. Appreciate that not every vintage is the same and try to understand what makes a wine less “easy-drinking/tasty, etc” one year (for example) compared to another. I think the single biggest responsibility for us as both wine buyers and consumers is to support winemakers, in both the good and bad years. I worry about natural wine being a trend, as trends fade, but for these winemakers, natural wine is their life. It is imperative that we all understand this and approach tasting, drinking and buying in a more holistic fashion. The one thing that always blows me away about winemaking is that you get ONE shot at it per year. Also, I would like to draw the discussion away from sulphur…I am so bored talking about sulphur and natural wine! I would like my “students” to see winemaking as a holistic activity wherein everything is connected. It all begins with healthy soil, healthy vines and biodiversity – and the fundamental idea that you encourage life, rather than destroy it. Whether you agree with adding sulphur to wine or not, I think it’s a very personal choice for every winemaker, and it’s important that we try and understand the reasons behind these decisions before automatically judging the wine and the winemaker. But, most of all, I would like the course to inspire curiosity and passion! Give us examples of a few wines that you feel reveal real integrity and tell us what it is about these wines that you love. I love the wines from Franz Strohmeier. I was lucky enough to visit him and his wife Christine last year. The lunch Christine had prepared and how their house looked completely chimed with how their wines felt to me. This may sound strange, but their lives and their wines were in perfect sync. They display integrity both as people and as winemakers. No gimmicks, no buzzwords – authentic wines from authentic people. I had the same feeling when meeting and visiting Maria and Sepp Muster. They radiate integrity. I also love the wines from Renaud Guettier, (La Grapperie). His wines come from 15 tiny plots and you sense this meticulous devotion when you speak to him about his wines. There’s so much soul and emotion in the wines, life and energy also – you get the feeling that Renaud has literally poured blood, sweat and tears into his wines. I’m also a big fan of La Stoppa and Elena Pantaleoni. She talks about choices and having to make decisions – something I really respect and admire. It is refreshingly honest, when a lot of other winemakers talk about “nature making the decisions”. As someone who believes in the “power of the Universe” I get all of that, of course, but it is also great when winemakers speak intellectually about why they have taken the decisions they have. Plus, Ageno from La Stoppa will always be a classic wine for me.